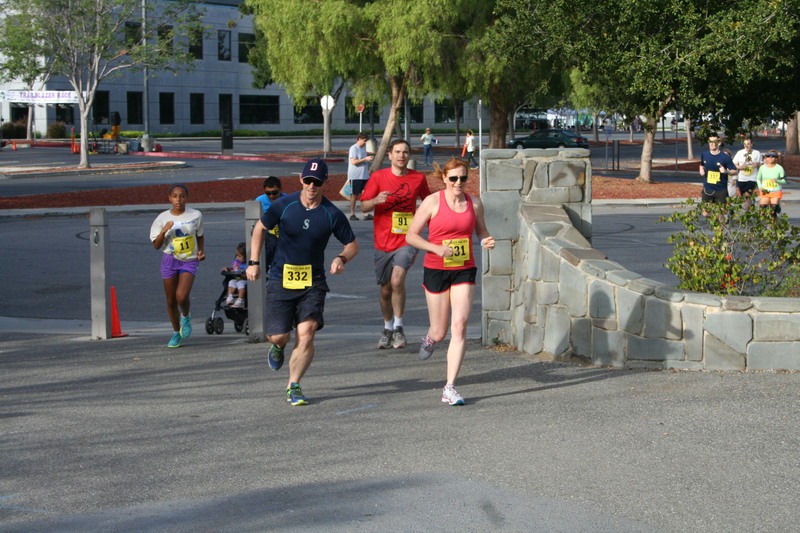 Our third race of the weekend was the 21st annual Trailblazer 5k in Mountain View, CA. Similarly to the Moonlight 5k on Friday, it was a race along the edge of the San Francisco bay, but this time in bright sunshine on a Sunday morning. This was a really nice mid-sized race. Super well organized, plenty of parking, great crowd, nice course, and a beautiful day to be racing. If you’re looking for a fun race, this is one to pencil into your calendar for next year — and there’s both a 5k and a 10k, and runs and walks too. We started off slow, promising ourselves we’d aim for 25+ minutes for the 5k race after two races in the two previous days. As usual — and Selina claims it’s my fault — we sped up as the race ran along, and wound up traveling at just over a 7-minute mile for the final mile. Sigh. Anyway, the result of our labors was that I came 27th out of 300+ folks, and Selina came 28th. As is common in our racing adventures, she was the 5th woman and won her age group, and I didn’t; in fact, I was 10th in mine. Sigh again. Well, that’s 34 races done, and 3 in one weekend. Only 18 more to go this year, and around 13 weeks to do it! Wish me luck!